ST. GEORGE – A former NASCAR driver and his companion pleaded not guilty in Fifth District Court via their lawyer Monday to charges connected to a multi-state pursuit and drug case. Attorney Douglas Terry entered not guilty pleas on behalf of his clients, Timothy Tyler Andrew Walker, 33, and Raelle Hann McDonald, 30, both of Hermosa Beach, Calif. Though both Walker and McDonald are out on bail, neither made an appearance in the courtroom and matters were handled through their attorney. Both have chosen to waive the preliminary and arraignment portions of the trail process, Terry told the court. The next hearing, a review hearing, is set for Sept. 5 at 10:30 a.m.
Charges against Walker and McDonald stem from a Jan. 11 incident in which they were accused of fleeing from the police and drug possession. A reckless driver on northbound Interstate 15 in Nevada was reported to dispatch and the Nevada Highway Patrol was alerted. One Nevada trooper clocked the car, a BMW, passing at 140 mph. The NHP initiated pursuit of the BMW which passed into Arizona and then into Utah where the tires were spiked at Utah mile post 2 and all four tires blown. The car then pulled over at mile post 6. Once stopped, a statement from the Utah Highway Patrol said, Walker attempted to flee on foot but was quickly subdued by an Arizona Highway Patrol trooper. McDonald was taken into custody without incident. According to the UHP statement, a subsequent search of the BMW found meth, marijuana, drug paraphernalia and alcohol. 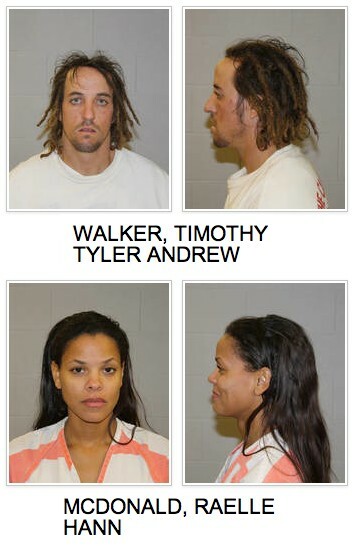 Walker and McDonald face a series of class B and class C misdemeanors related to drug possession and alcohol. They also face two drug-related third felonies each. In addition to these charges, Walker also faces a class B misdemeanor for DUI, and a third-degree felony for fleeing from police. Walker is a professional race car driver, having previously raced stock cars and trucks in various NASCAR races. He was suspended from racing in 2007 for violating the association’s drug policy. Don’t like to pass judgment, bit it sounds as if the lad may have a bit of an issue with illegal substance abuse. Just sayin;. …. And then there’s felony-stupid… During a 140 mph chase he didn’t think of tossing the meth out of the car?